MPVIEW(Multi-Platform Venus Imager to Elucidate Waves) is a small multi-satellite mapping system to fully monitor and characterize planetary-scale waves in Venus’ atmosphere. To understand the angular momentum budget that maintains superrotation, general circulation models are valuable tools. They show that mean meridional circulation, thermal tides (diurnal and semi-diurnal components) and planetary-scale waves (periods around 4-6 Earth days, wavenumbers 1 or 2) play a role in this subtle balance. To validate the simulations, it is crucial to characterize these three components through observations. Thermal infrared is the only wavelength range where day and night sides can be observed at the same time. On the day side, UV and visible observation provide additional information about the zonal and meridional wind field. A good time/ longitude coverage of Venus in both the thermal infrared and the UV-Vis would give the temperature, zonal and meridional wind fields at the cloud-top, and could help characterize the major players in the angular momentum transport, at least near the cloud-top. While it is not enough to fully characterize the circulation through observations only, it would be a crucial constraint to validate circulation models. This coverage would also give access to a full monitoring of the stationary waves that have been observed by Akatsuki and that are related to interaction of mountains with the near-surface flow. This monitoring (timing, frequency, position, variability of the bow-shaped waves) would give constraints on the modeling of the near-surface circulation, which is an additional and very valuable constraint on the GCM simulations and on the atmosphere-surface interaction. MPVIEW consists of two nadir-pointing smallsats, possibly released from one main satellite after Venus circular equatorial orbit insertion at typically 40 000 km altitude. The two smallsats are placed at 180° from each other on the circular orbit. The main satellite may be used as one of the two platforms. The two smallsats are equipped with a multispectral Vis/IR radiometer, rather similar in terms of wavelengths and of field of view (and spatial resolution) to the addition of the LIR instrument onboard Akatsuki and of the VMC camera on Venus-Express. 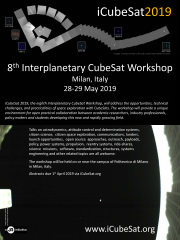 We will present the results of a preliminary study aiming at characterizing the best solutions in terms of orbit parameters and periods to maximize the longitudinal coverage of MPVIEW in order to monitor and fully characterize the complex wave system in Venus’ atmosphere.